“The Lord will open a way,” the angel said to the very discouraged Experienced Social Settlement Worker who had come all the way from Boston to Niagara Falls after being assigned an especially difficult task by the War Council of the Y.W.C.A. Though “wholesome, cultured, generous and noble,” it had become undeniable: our Miss Elizabeth Howe was on the verge of defeat before she even began. She had traveled the world over, had worked in many unique situations, but this job in Niagara Falls was seemingly impossible. It was early fall, 1919, when she admitted to Angelo, the Italian janitor at the local Y.W.C.A., that she may never find suitable quarters for the home she was instructed to create for her project. Every place that seemed a satisfactory location had been denied after she explained its ultimate purpose: to serve as a sort of service bureau for the foreign born. But Angelo was right. Two days following her heart-to-heart with the angel, another Italian opened the door to a small three-roomed flat in the heart of Tunnel Town, a tenement house, an ex-macaroni factory. It was here, amid the buzz of the construction workers, the dust and the plaster, that Miss Howe was finally ready to exclaim: This is it! And it was it…. 1116 East Falls Street, though an empty lot today, was the setting for immeasurable miracles. It’s one of those places in Niagara Falls that should be enshrined for its glorious past. It should especially draw you in if you descend from any of the massive amounts of immigrants that flooded into this city after the First World War--the Italians, the Armenians, the Polish, the Syrians, the Lithuanians, the Russians, the Spanish--to name a few--and even more so if you are a woman. It was on this spot of earth that a sisterhood of female workers, led by the indomitable Elizabeth Howe, made Americans of thousands upon thousands of women and paved the way for a new world for their granddaughters. My favorite Miss Howe story occurred in November of 1920. I really can’t read it without shedding a few tears. Imagine Mrs. S….an Italian woman in Miss Howe’s conversational English class. An otherwise enthusiastic pupil, she was terrified of the snow (after breaking her leg a few years before) and had announced to the class that she probably would not venture out if the snow was bad. Perfect attendance was something all of the women aspired to and something Miss Howe promoted for she knew all too well how easy it would be for the women to fall out of school. Class began this one particular blustery day—without Mrs. S. The women shook their heads at Mrs. S’s absence. But then, there she was! She had come after all. Her classmates clapped their hands with joy when she appeared and when the excitement subsided she told the class of the “miracle” that had occurred. Even as hard as it had snowed, and she had decided to stay home, she looked out of her window and saw a perfect path had been shoveled from her door to that of the International Institute. “Il Signore vi spira una via…” One can only imagine who had produced this “miracle.” I’m sure the women knew straight November 15, 1922away, but Miss Howe does not elaborate. The best part of the story is the end, though. Miss Howe scribbles one last thing: “Mrs. S. is the wife of an American citizen and when Mr. S voted, Mrs. S. voted, too….” When I read this over, I realized that this was not just “one last thing…” It was the first election that American women could lawfully vote in due to the passage of the 19th Amendment to the US Constitution and Mrs. S. had voted! As moving as this may have been, Miss Howe added one more little footnote….”I’m sorry to add to the story that Mrs. S. voted according to the advice of her husband….” Miss Howe knew we still had a ways to go…but it was a start. I think it’s inevitable that this time of year, my colleague (Pete Ames) and I think of Miss Howe. He introduced me to her a few years ago. She is his favorite stop in Oakwood. Quite appropriately, she lies in Strangers Rest, among the stunters and the great challengers of the Falls—for in the end, she, too, fought bravely against the odds. She was only here for a few years however her great legacy of love remains. Even the newspapers of her day remarked about her work of love. Pete and I have planned to stand over her grave on November 15th, the anniversary of her death, and tell her how she isn’t forgotten, how we love her. I plan on saying it in Italian, the language of my ancestors, and he plans on saying it in Armenian, the language of so many of her students. After learning of her story, perhaps you will think of Miss Howe, too, in November. It was the month of her birth, the month of her death. Strangely, it is the month we choose to elect the leaders of our nation—that right so sought after by our great grandmothers. It’s that time of year when the leaves fall and the trees are left empty and naked, their jagged bones scratching against a gray sky—wondering whatever happened to the beautiful blue heavens? It was Miss Howe who let everyone in out of the cold and into that little promised land that she called the International Institute. Clementina Ventresca FortunaIt just so happens that in November I also think of my great grandmother, Clementina Ventresca Fortuna--who has a birthday this month, too. I doubt my great grandmother and Miss Howe ever met, but their stories do, indeed, meet in this city at the edge of the world. My great grandmother came to Niagara Falls, an Italian immigrant, just a few months before Miss Howe’s death. A young woman, fleeing a forced marriage, she found herself in this new and frightening place, longing to make it her home. My great grandmother learned enough English to get by and she and my great grandfather saw their dreams come true when they opened Fortuna’s restaurant in 1945. Her daughter, my grandmother, Gina Fortuna, born in 1924, would have given Miss Howe such pride. The child of Italian immigrants, my grandmother was determined from childhood to make her mark in the world. She hardly slept a wink during WWII, lying about her age to get herself a job at Bell Aircraft. Although her father gave her the option (and strongly favored it) to quit school in order to work the long night hours, continuing her education became her battle cry. While a mother of two, she went to college and obtained a Bachelors and a Masters degree. She even served as a county legislator in Niagara Falls. Somehow, she translated Miss Howe’s message into her own life and passed it onto all of the girls in the family: success is possible with confidence and knowledge. Miss Howe was only fifty three when she died of pneumonia on November 15, 1922. The incredible burden of her work proved to be too much, even for a woman of her stamina, and it seems that she literally had worked herself to death. Women of twenty five nations were brought together because of the hard work and deep devotion of one woman. Day or night she was there for those in dire need and thousands of acts of social service were rendered. The notes she kept are priceless. Sharon Henry, my colleague at the Lewiston Public Library, and I have transcribed what was left of the poorly microfilmed records from the International Institute. Her story has touched our lives and hopefully will reach into our daughters’ lives. Once upon a time there was a little fireball of a woman in Niagara Falls who paved the way so the rest of us may live in a world of opportunity and unlimited freedom. 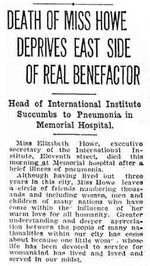 You are welcome to read the Reports of Miss Elizabeth Howe, International Institute, at the Lewiston Public Library.